"Most class in its class." Whether you’re driving on dry pavement, snow, mud or gravel, you’ll feel more confident knowing your Lincoln MKZ is equipped with available Intelligent all-wheel drive (AWD). That’s because AWD constantly monitors road conditions and automatically distributes engine torque to the wheels having the most traction. AWD is optional with the 2.0L EcoBoost® and 3.7L Ti-VCT V6 engines. Electric power-assisted steering (EPAS) continuously adapts to the driving environment. EPAS provides an easy, fluid feel of the steering wheel during low-speed maneuvers, and gradually becomes firmer as speed increases for a precise, confident feel on the highway. And that’s not all. Pull-drift compensation technology can detect irregular conditions, such as a crowned surface or crosswinds, and adjusts the EPAS system to compensate. You won’t feel the system working, but you will experience a pleasant sense of comfort. Continuously controlled damping (CCD) takes Lincoln luxury driving to another level. An advanced suite of sensors continuously monitors and adjusts the suspension. The sensors also detect body motions, steering and braking dynamics in milliseconds, faster than you can blink. Select the operating mode — Comfort, Normal or Sport — that suits the driving experience you prefer, from exceptional ride quality to a spirited, sporty feel. Ordinarily a conventional lever on the floor or steering column comes to mind when you’re thinking about the design of a gear shifter. But the 2015 Lincoln MKZ is different. Departing from the conventional, designers put the transmission controls in a vertical series of ergonomic buttons on the center instrument panel. For a sport-performance feel in a Lincoln MKZ, pressing the “S” button puts you in the Sport mode of Lincoln Drive Control. You can also enjoy sporty driving by using the paddle shifters (not shown) located on the steering wheel. Eliminating the floor shifter frees up space between the driver and passenger seats, and enhances the clean, uncluttered appearance that characterizes the whole of the interior. 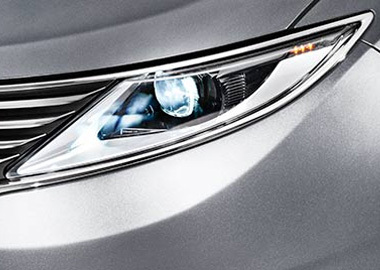 Standard full LED taillamps and standard LED headlamps beautifully blend elements of style and function. Not only are LEDs sharper and brighter than conventional incandescent bulbs, but they also illuminate faster and use less energy. The refined lines of the signature Lincoln split-wing grille integrate seamlessly with the headlamps and flow with the contours of the hood to create a unified, modern design. 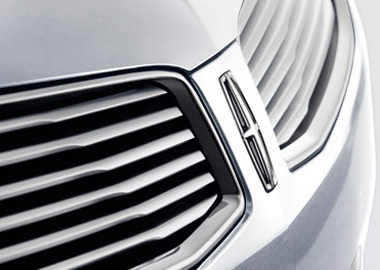 The sleek grille is indicative of how fluid the aerodynamic shape of the Lincoln MKZ truly is. Putting your hands on a cold steering wheel is a thing of the past with the available heated wheel, wrapped in hand-stitched leather for exquisite craftsmanship and luxurious comfort. It can heat quickly for a welcome feeling on cold winter mornings and an elegant touch all year round. The available THX® II Certified Audio System is custom-tuned to each Lincoln model. It puts out 700 watts of power, features 14 strategically placed speakers – including a pair of 6-inch by 9-inch subwoofers – and a single-disc in-dash CD player with MP3 capability. Comfort in the Lincoln MKZ is luxurious. These premium leather seating surfaces are trimmed in soft, sumptuous leather, with the front seats heated or cooled to suit the season. The front seats can adjust at the touch of a button to fine-tune comfort to your individual needs. The driver’s seat memory feature allows you to have your personal seating preferences available anytime. Connect to your MKZ remotely using the available MyLincoln Mobile™ app. The available embedded modem communicates with the smartphone app and allows you to start, lock, unlock and locate your vehicle from virtually anywhere. And you can even set up a scheduled remote start. Simply open the app and use it set your MKZ to start up five to ten minutes before you have to head out — it will be warmed up and ready to go when you are. Bumper to Bumper: 4 years / 50,000 miles Powertrain: 6 years / 70,000 miles Safety Restraint System: 5 years / 60,000 miles Corrosion (Perforation only): 5 years / Unlimited miles Roadside Assistance Program: 6 years / 70,000 miles. It happens at times to the best of drivers – unintentionally drifting out of the driving lane. That’s when you’ll appreciate this customizable, driver-activated system. There is a camera mounted behind the windshield that monitors road lane markings to determine vehicle position and detect a lane departure. Through a series of steering-wheel vibrations, which resemble driving over a rumble strip, the lane-keeping alert warns you that you’re starting to drift. Lane keeping aid actively applies steering torque, which alerts you to direct your vehicle back into the target lane should the system detect an unintended lane departure. Available adaptive cruise control functions just like normal cruise control — with one important difference. When the radar sensor detects traffic slowing ahead, your vehicle also slows down. And when traffic has cleared, your vehicle resumes its set speed. Forward collision warning with brake support can alert you if it senses a potential collision with the car in front of you. A heads-up display, which simulates brake lights, flashes on the windshield and provides an audible warning. If you don’t react quickly enough, the brakes will precharge and increase brake-assist sensitivity to provide full responsiveness when you do brake. The available BLIS® (Blind Spot Information System) with cross-traffic alert helps make driving more convenient. It uses radar to determine if a vehicle is detected in your blind spot and alerts you with an indicator light in the appropriate exterior mirror. Cross-traffic alert also uses radar to watch for traffic behind you as you’re slowly backing out of a parking spot or your driveway. If cross-traffic sensors detect a vehicle approaching from up to 15 yards away, you will be audibly and visually alerted.